February 3 - 6, 2018, Washington D.C.
We are excited to reconvene the Catholic Social Ministry Gathering after having taken a one-year hiatus to support the Convocation of Catholic Leaders: The Joy of the Gospel in America in July 2017. CSMG 2018 will highlight the inspiring work of Catholic leaders from around the country and explore the opportunities to respond to Pope Francis’ call to go out to the peripheries as missionary disciples and promote love and unity that leads to thriving neighborhoods and communities. Join more than 500 diverse leaders at the 2018 Catholic Social Ministry Gathering as we gather to pray, learn, connect, and take concrete actions to love God and our neighbor. “The earth is our common home and all of us are brothers and sisters. If indeed 'the just ordering of society and of the state is a central responsibility of politics', the Church 'cannot and must not remain on the sidelines in the fight for justice.' All Christians, their pastors included, are called to show concern for the building of a better world." Organized by the USCCB Department of Justice, Peace and Human Development in collaboration with 16 national Catholic organizations, CSMG participants share inspiration, fresh perspectives, and new vision for how to put faith into action at home and abroad. Don’t miss this unique networking opportunity with social ministry professionals from a cross-section of Catholic ministries! Cardinal Daniel N. DiNardo of Galveston-Houston, will be our principal celebrant & homilist for our Sending Mass on Tuesday, February 6, 2018. 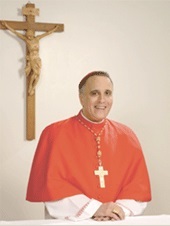 Cardinal DiNardo serves as the President of the United States Conference of Catholic Bishops. The Catholic Social Ministry Gathering is only made possible through the generous support of its sponsors. Please learn more about our Sustaining and Supporting Sponsors below.